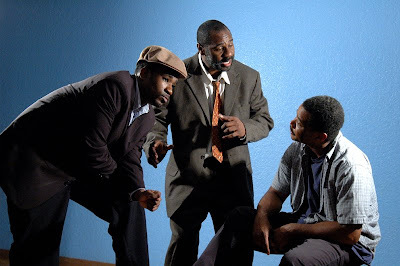 Due to popular demand, American Stage Theatre Company has extended by one week the run of August Wilson's hit drama, King Hedley II, thru Feb. 22. This is an intense drama that will make you ask all sorts of questions about the elusiveness of the "American Dream," in a society riddled by racism and classism. King Hedley II will be familiar to audiences who saw American Stage’s critical hit production of August Wilson’s Gem of the Ocean last season. The death of Aunt Ester, a gamble to peddle refrigerators, a garden of seeds, and a final act of retribution are the threads that make up the tapestry of Wilson’s 1980s installment in the author's renowned cycle of plays. King Hedley II recently was released from jail and is now trying to sell stolen refrigerators in the poor side of Pittsburg to raise enough money to purchase a video store. As he and his new family begin to rise above their limited opportunities to attain their Ronald Reagan-era “American Dream”, a ghost from the past re-enters Hedley’s life that forces him to confront his own pattern of petty violence, self-destruction, and self-doubts. Wednesday and Thursday evening curtain is at 7:30 p.m.
Friday and Saturday evening curtain is at 8 p.m.
Saturday and Sunday matinee curtain is at 3 p.m.
Tickets prices are $24-$39 depending on date and time of performance. Students Rush tickets are $10, 30 minutes prior to curtain.